The Chinese theme buildings along the Grant Avenue corridor in San Francisco were constructed after the 1906 earthquake to create a positive image of this formerly notorious quarter. 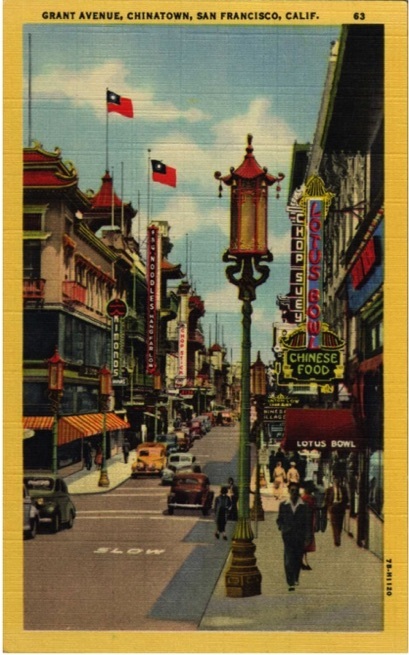 Chinatown’s pre-earthquake image was one of prostitution, gambling and opium dens; a forbidden quarter often best avoided. In order to increase tourism and create a more pleasant environment, a Chinese American born shop owner, Look Tin Eli began reconstructing Chinatown with the Chinese style buildings so familiar to us today. Eli used Caucasian architect Thomas Patterson Ross in creating an Anglo view of what China looked like, something that would be palatable for Europeans. 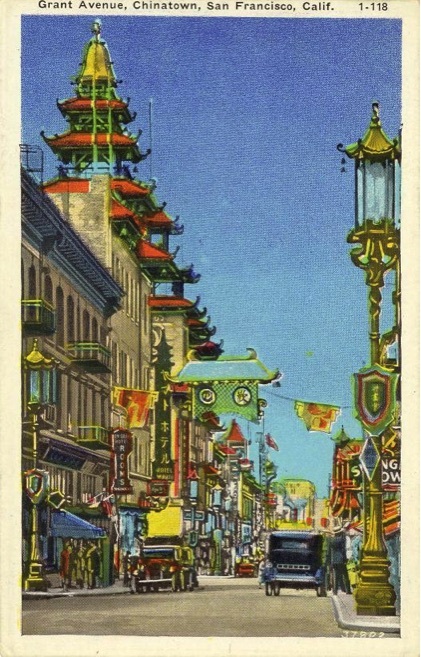 In 1925 during the San Francisco Diamond Jubilee Festival (Celebrating the 75th anniversary of California statehood), D’Arcy Ryan, director of illumination designed 43 dragon street lamps to be cast in China and installed along Grant Avenue from Bush Street to Broadway. The dragon was chosen because of it symbolizes good luck, good fortune and longevity. 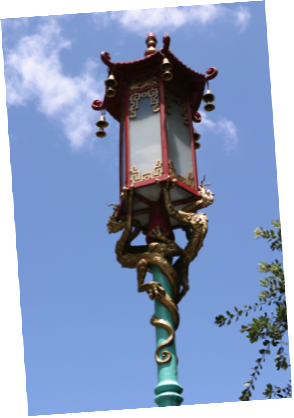 Ryan's design is composed of a cast iron base supporting a lotus and bamboo shaft surmounted with two cast aluminum dragons below a pagoda lantern with bells and topped by a stylized red roof. 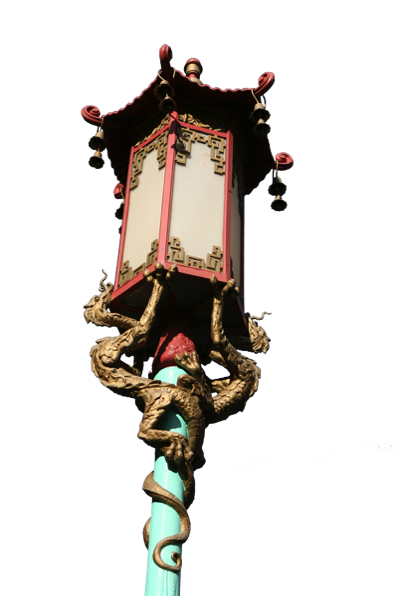 Each of the 2,750 lb lamps is painted in traditional Chinese colors: red, gold and green. The entire project cost the staggering sum, at the time, of $18,000 or $418 for each. The money raised for the private project was a joint venture by the Downtown Merchants Association, the Chinese Chamber of Commerce and the San Francisco Diamond Jubilee Festival. The original lamps were manufactured in China for the occasion. In 1996 the city using the original molds had 24 new lamps manufactured by Emery Fixtures Inc. of Emporia, Kansas. The new lamps replaced some of the original fixtures and can be easily identified by the companies named on the bases access plate. The original lamps are spaced evenly along Grant Avenue with the only exception being where two lamps are in close proximity to each other at 924 Grant Avenue where you can see them side by side. These lamps, according to local legend, were placed here in front of the Lung Kong Association building because of the “special connections and inﬂuence at the time” (Lung Kong means “dragon light.”) After the close of the Diamond Jubilee Festival in 1925 the original lamps were deeded to the Paciﬁc Gas and Electric Company and have only had periodic maintenance repainting and a few replacements since that time. 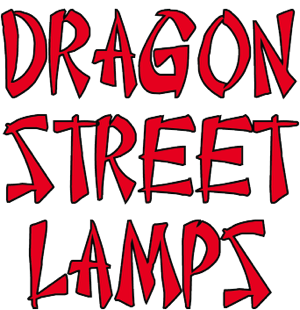 Recently an additional 23 new dragon lights have been added to bring a more Chinese ﬂavor to a broader area of Chinatown making for a total of 71 lamps. These new lights were again made from the original molds by a foundry in China, a project sponsored by PG&E.